Tania Vaughan: Time management - what did Jesus know? 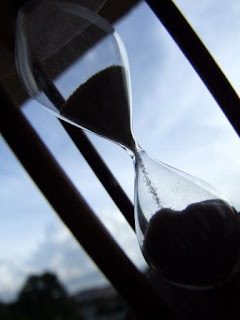 Time management - what did Jesus know? I have realised recently that Jesus knew what it was like to busy. He knew what it was like to have no time to Himself and how it feels when it seems everyone wants a piece of you. In Mark 1:28 it says "news of Him spread quickly". That is the start of busy. Like when someone starts telling others that you're good at sewing, baking or powerpoint presentations! Verse 33 "the whole town gathered" suddenly everyone wanted a piece of Jesus, they needed a miracle, a word or just to see and people flocked to see him. Now we don't often get the whole town, but sometimes the odd "I saw what you did / made it was really good, would you consider....". You know how it goes! Jesus knew the importance of getting some time to Himself verse 35 "He went to a solitary place" and He knows what it's like to have that interrupted or have someone trying to make you feel bad for taking time out, verse 37 "Everyone is looking for you!". Just when we think we have our schedule organised, our quiet time pencilled in, suddenly someone is looking for us. What did Jesus do in this situation? Verse 39 "He carried on", but He did recognise the trigger, verse 44 "Don't tell anyone". It's what we do, we say "I can do it just this once, but don't tell people otherwise I'll be asked again". We do have to try and set limits, we can't do everything. Jesus knows this doesn't often happen.... verse 45 "But he did and as a result Jesus could no longer enter into towns but stayed in lonely places, but people still came to find Him". We hear from our friend "Oh, I only mentioned it to.....". As we try to take time out, withdraw to recharge, the phone rings and the email pings and people seek us out. Stories like this continue throughout the book of Mark. Jesus knows what it's like to need more hours in the day and He knows what it's like to have to force time away. In Mark 9:30-31, Jesus manages to get away, He doesn't tell anyone and He takes His disciples away to teach them. Jesus knows the priorities and how hard it is to stick to them. He knows the importance of getting away to learn more about God, to spend quiet time with Him and grow in our understanding. If you struggle to find that time in your day to be quiet, to take time out, then be encouraged, Jesus knows your struggle, He's been there too. You've taken a moment to read this, just take one moment more to be still and give God this moment. One little moment soon grows in to many little moments. I have been struggling in this area and just found this today. Thank you.